Box of 5 Lightfield® HybredTM EXP 12 Gauge 2 3/4" 1 1/4-oz. Sabot Slugs. Designed for maximum expansion! 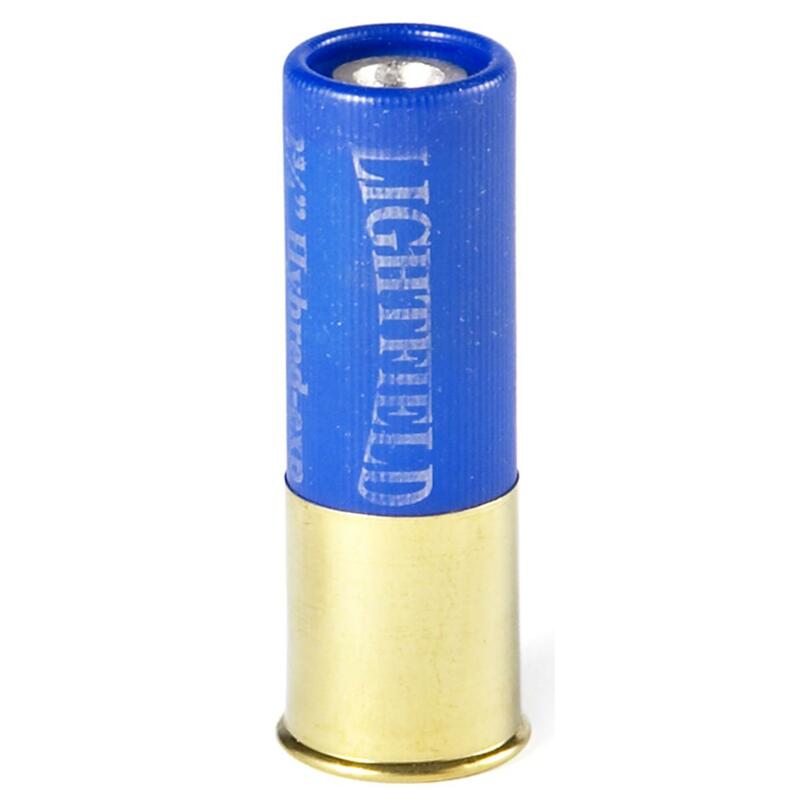 Lightfield® packed these with soft lead slugs that expand on impact for devastating damage. And that's not all these are packin'... behind the slug is an Impact Discarding Sabot that stabilizes flight, and discards when it finds its mark. Muzzle velocity: 1,450 f.p.s. Muzzle energy: 2,549 ft. lbs. Designed and optimized for use with rifled barrel, still effective with smooth bore. 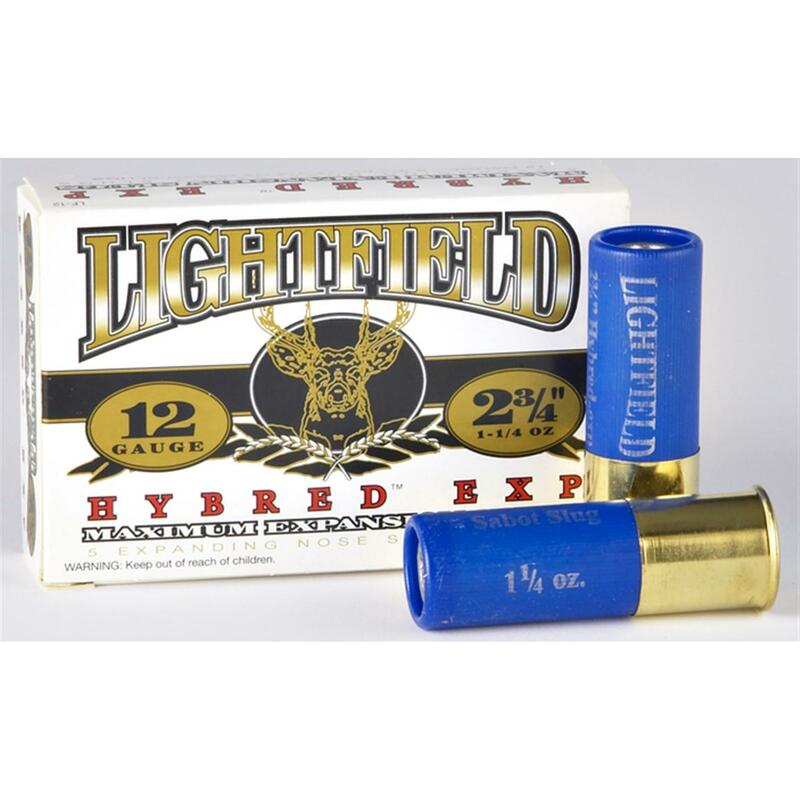 Box of 5 Lightfield Hybred EXP 12 Gauge 2 3/4 1 1/4-oz. Sabot Slugs is rated 4.6 out of 5 by 13. Rated 5 out of 5 by Jimmy from Fair price and ample availability Purchased this product because a hunter friend has been using these for several years. The accuracy of these sabot slugs has been proven time and again with clean kills at mid to long range. One thing, I should add is that he will never take a shot at a deer if there is any probability of a wayward shot missing the kill zone. That means that a hunter should never attempt to make a shot through thick brush or other obstructions which can divert a fired bullet. Hunting ethics is an absolute necessity. Rated 4 out of 5 by Will from Fair price Ordered some shirts and grabbed a couple boxes. Always use Lightfields. Great knock down. Rated 5 out of 5 by Will from great price used a free shipping code so extra good price. Rated 5 out of 5 by dan57 from WELL WORTH THE PRICE I have used these slugs in my 12 gauge for several years and they are wicked. I have recovered every deer that I or someone using my gun has shot within 50 yards. Great expansion and retention of weight. Rated 5 out of 5 by Dan1 from lightfields Great product , lots of knock down power and 1" groups at 100 yards. Rated 5 out of 5 by CHRISTOPHER from Have not used them yet, but always satisfied with Lightfield. Rated 4 out of 5 by HARRY S. from It's what I like to use. Rated 5 out of 5 by RICHARD from these are hard to find but thanks for our idiot governor we wont be able to order them anymore. 10 rounds Kent Tungsten Matrix Waterfowl Loads 12 Gauge 2 3/4", 1 1/4 oz.